On September 11, 2001 the man everyone knew as E. Michael Caner began to transform. Evangelicals were in shock, along with the rest of America, after seeing thousands die in the name of god. Starved for answers from a Biblical worldview, Caner stepped up with them. By April 15, 2005 his transformation into Ergun Mehmet Caner was complete. 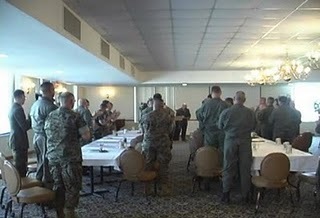 On April 15, 2005 Ergun Caner conducted two training sessions for the United States Marines in New River, North Carolina. The United States Marines provided Witnesses Unto Me with video footage of this training. One session was labeled “theater” and the other “o-club” (photo) indicating the location of the training. Caner starts both sessions with an autobiographical sketch which paints a clear picture of him being born and raised in Turkey and being trained as a terrorist before coming to America. This is the experience which gives Caner the authority to train the US Marines on “protocols of jihad” and Islamic culture. The problem, as Witnesses Unto Me readers know, is that Ergun Caner was born in Sweden, not Turkey, moved to the United States at age two, and beginning when he was eight years old lived with his non-Muslim mother. It is unclear at this point what kind of damage has been done. Ergun’s factual claims concerning growing up in Turkey and the authority on which he speaks is blatantly false. It is not known to this author if the actual teaching on Islamic culture and protocols of jihad was fabricated as well. If that information was false as well, the Marines trained by Ergun Caner need prayer while deployed in Islamic countries. Dr. Caner was contacted by Witnesses Unto Me in the spirit of Matthew 18, but he would not respond. He was again contacted by Witnesses Unto Me for comment in hopes of fairly representing his position, but again did not respond. More than three weeks have passed since the first contact on this specific matter and nearly 10 months have passed since Witnesses Unto Me’s initial contact with Caner concerning erroneous statements in his speech. The only public comment to come from Caner since June 25th seems to be coming from his India based PR firm. UPDATE: Due to a copyright claim from Caner, the videos have been removed from the internet while the claim is being litigated. 4/22/14 UPDATE: US Court ruled on 4/17/14 that the video evidence posted here did not violate copyright law and YouTube re-posted the video on 4/22/14, which is again posted below.